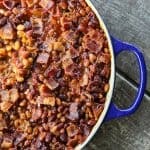 Barbecue Bacon Spicy Baked Beans are chock full of browned pork sausage, bacon, and enough spicy barbecue sauce to be so flavourful and so perfect that no one will ever believe these start with canned beans. Last fall I had the distinct privilege of being able to travel with my friends at Certified Angus Beef to meet their exceptional beef producers in Kansas. One of the highlights of the trip was taking a hay wagon into the Kansas prairie where chuckwagon chefs Cowboy Kent Rollins and his wife Shannon Keller Rollins prepared a fantastic meal for us. This meal was memorable for the gigantic charcoal-grilled steaks, the cast-iron Dutch oven baked biscuits, the hominy casserole, and the most tremendous barbecue and bacon packed spicy baked beans. Cowboy Kent and Shannon were generous enough to share their recipes with me and I am, in turn, so happy to bring those glorious spicy baked beans to you today. 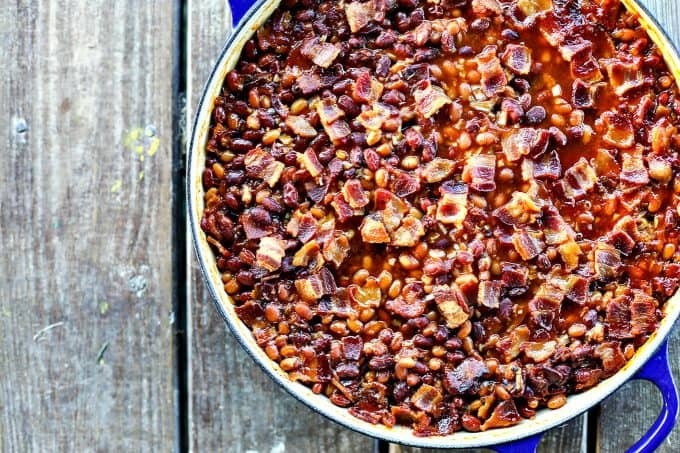 Here’s the thing about those barbecue bacon spicy baked beans; they taste like you slaved over them. They have a fullness of flavour that comes from starting with dried beans and slowly building in layer after layer of spices and aromatics, but there’s a surprise in store. You could have knocked me over with a feather when Cowboy Kent told me he made the with canned beans. I may have goggled at him. I never thought that this level of taste was possible from a canned bean. Within days of arriving home, I made a batch of spicy baked beans for my men. I made a couple of alterations based on what I had handy in my refrigerator and pantry and ended up liking them so much that I am presenting that version to you today. Since Cowboy Kent has built a career on making great food based on what he had available and rolling with the proverbial punches, I’m pretty sure he’d approve of my swaps. Any good bulk pork sausage will do for these spicy baked beans, but I especially like bulk hot Italian pork sausage for it. I’ve also used my homemade turkey breakfast sausage and really loved it. If you DO use the turkey breakfast sausage, please reverse the order and cook the bacon first, using some of bacon fat to keep the sausage from sticking. The reasoning for this is that turkey sausage is FAR leaner than pork sausage and has a tendency to adhere to the pan. The bacon fat will help prevent that. If you’re subbing in turkey bacon, too, you’ll need to add fat in the form of olive oil to keep things from sticking. You’ll have leftover chipotles in adobo which gives you a chance to employ one of my favourite economical tricks in the kitchen. You can freeze the leftover chipotles and sauce in ice cube trays, placing one pepper in each ice cube well and spooning a little sauce in with it. When frozen, pop them into a resealable zipper top bag and label with the contents and date. Then you can pull as many chipotles as you’d like whenever a recipe calls for them. When it comes to draining the chili beans and pork and beans, the quickest and simplest way is to dump them into a colander. There’s no need to get super careful about this; you don’t need them to be bone-dry. Just let the excess liquid drain off. This recipe is adapted from and with thanks to "A Taste of Cowboy: Ranch Recipes and Tales from the Trail" by Kent Rollins and Shannon Keller Rollins. Place a large, oven safe skillet or dutch oven over medium heat. Add the sausage to the pan. Use a sturdy spoon to break up the clumps. Fry the sausage until it is cooked through and has some crispy edges. Use a slotted spoon to transfer the sausage to a paper towel lined plate. Pour out the fat and return the pan to the heat. Add the bacon and cook until crisp. Use a slotted spoon to transfer the bacon to a paper towel lined plate. Drain off all but about 2 tablespoons of the bacon fat. Return the skillet or dutch oven to medium heat. Add the onions, stirring to coat the onions with bacon fat. Stir fry the onions for 2 minutes. Stir in the garlic and minced jalapeno and fry for 1 minute, or until very fragrant. Add the barbecue sauce, brown sugar, yellow mustard, and mashed chipotle in adobo to the pan or dutch oven. Whisk until the sauce is evenly combined, then stir in the chili beans, pork and beans, the sausage, and 1/2 of the crispy bacon. Scatter the remaining bacon over the top of the pan and bake, uncovered, until the beans are bubbling hot. 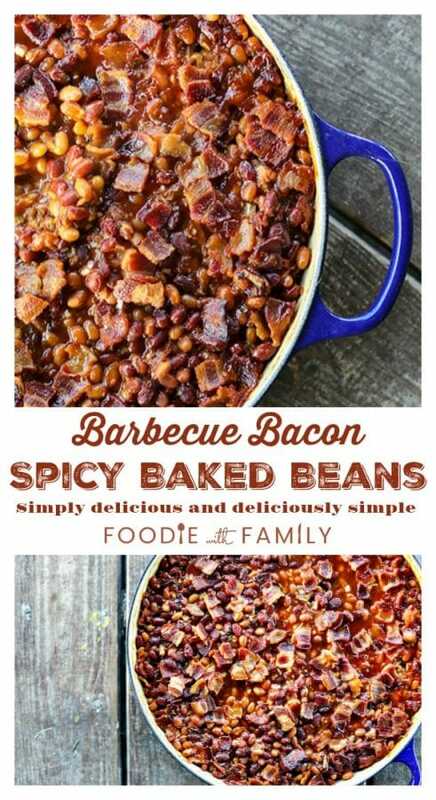 Do you love these Barbecue Bacon Spicy Baked Beans? Try these bean recipes! These are the best beans ever! I used chicken sausage (sweet Italian) and used jalapeño Tabasco instead of fresh jalapeño so I could adjust the spice more easily for kids. Thanks so much for sharing this one, it’s a winner! Hooray, Marina! I’m so glad you loved them as much as we do. Ridiculously easy, too, right? We loved that trip so much! Thanks for sharing so much flavor, and for warming our hearts with memories on this cold winter day! I just love you guys all to bits. 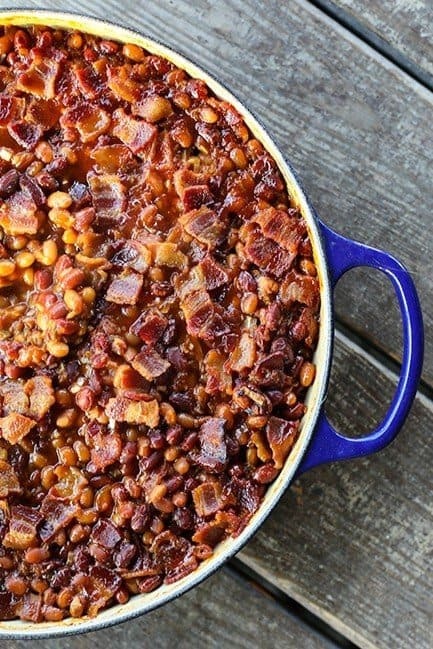 I wish we could gather around a table with a pot of these baked beans and some fabulous pot roast made from Certified Angus Beef chuck roast!